Thor is the next Marvel franchise headed our way leading up to the team-up Avengers film. 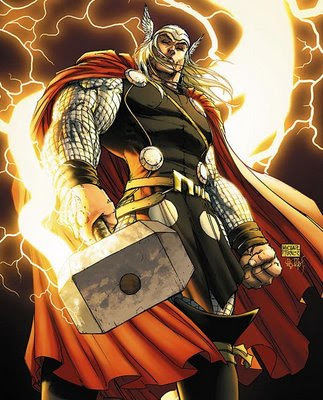 The film has landed a talented thespian/director in Kenneth Branagh, it has a completed script, no actors yet, but a lot of questions have arised surrounding just how will the Norse God Thor, be tied into the Avengers universe. Both Iron Man and Incredible Hulk were done in a very realistic world and tying Thor, who comes from Norse mythology, might be a little tricky. Well, the folks over at IESB, have some inside scoop on just how Thor will be tied into the realistic world setup by Jon Favreau and Louis Leterrier in their previous films. The "Thor" script and film have been previously reported as being solely set in Asgard. 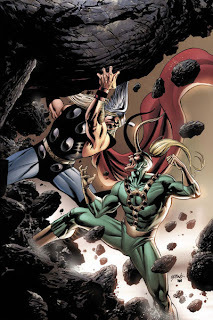 (That's Thor's native world for all of you that didn't grow up reading comics or still haven't figured out what Google is) It seems that while the film will take place in Asgard with Thor dealing with his wicked brother Loki and his father issues with Odin, Donald Blake will be setup in modern times. Who is Donald Blake you might ask? He is the human form of the Norse God Thor. In the comics, Thor is sent to live amongst the humans on Earth with no memory of his past or life as Thor. Donald Blake aka Thor, finds Mjolnir (Thor's Hammer) and he is instantly reminded of his powers and history. IESB is reporting that this story arc has been written into the end of the script. While I am glad Marvel and Branagh have found a good way to tie into the realistic world, it would seem more logical if the film actually opened with Donlad Blake and his life on Earth. Having Blake find Mjolnir and then begin a memory flashback of his life in Asgard. The memory flashback would then spend the majority of the time, as planned, in Asgard and finish the film with Blake understanding how he can use his powers to help mankind here on Earth, ultimately joining the Avengers.